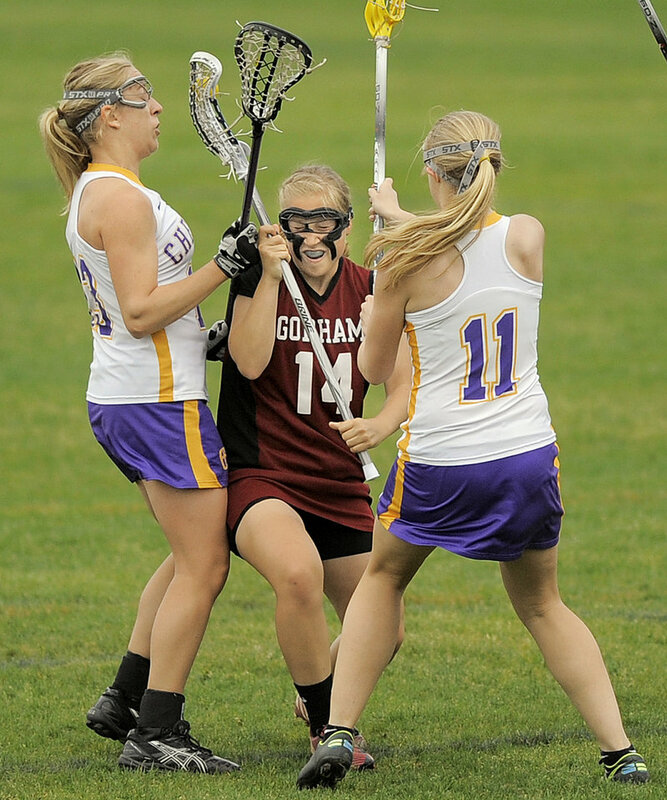 The Stags take control in the second half, then get a late goal after Gorham rallies in girls' lacrosse. PORTLAND – In a game that came down to possession, it only made sense that Cheverus attacker Meredith Willard ran out the final moments behind the Gorham goal with the ball nestled in the basket of her stick. Willard scored seven goals and Alex Logan added four Thursday to lead Cheverus to a 14-12 victory against Gorham in a back-and-forth girls’ lacrosse game at Boulos Stadium. 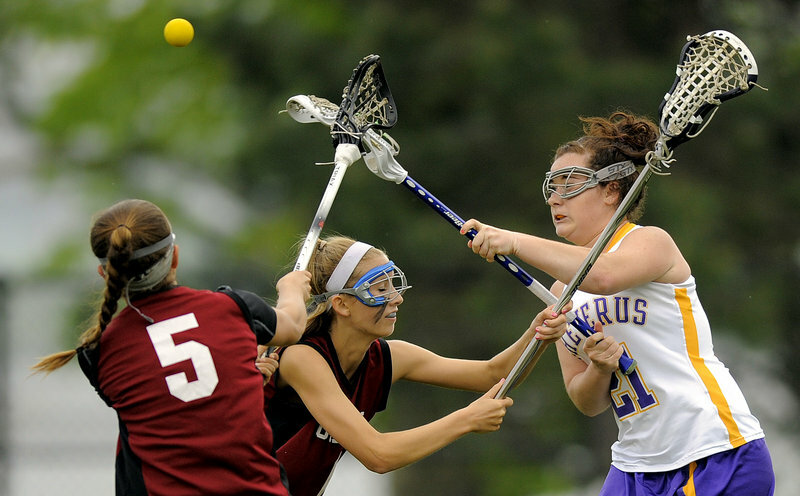 Meghan Cushing of Gorham looks to advance between Alex Logan, left, and Mary Kate Slattery of Cheverus during Cheverus’ 14-12 victory Thursday in schoolgirl lacrosse. MaryKate Walsh, Nicole Pineau and Staci Swallow added goals for the Stags (9-2), who bounced back from a 5-3 loss Tuesday at Thornton Academy. Hope Correa made six saves, including two back-to-back gems in the second half that slowed momentum for the Rams. Kali St. Germain and Aliza Jordan each scored three goals for the Rams (4-6), who lost their fourth straight. Katie Tucker had two goals and an assist. Haley Perkins, Abby Hodgkins, Meghan Cushing and Shannon Folan each had a goal for Gorham, and Maddy Hamblen came up with three saves. The first half closed with two goals by Cheverus in the final 1:43. Swallow scored from a free position to tie it at 8-8, and Willard fed Logan for a goal with 1.5 seconds remaining to take the lead for the final time at 9-8. Gorham started the second half in the Stags’ end, testing Correa, and defenders Mary Kate Slattery, Emily Rodrigue and Madison Aldrich. But the momentum turned and the Stags ran off four straight goals to grab a 13-8 lead with 12:40 left. But the Rams weren’t done. Morgan Cushing again began controlling the draw (Cheverus had a 13-11 edge), and her sister, Meghan, continued to force turnovers and dig up ground balls. The Rams scored four goals in 4:37, including two by Jordan, to cut the Stags’ lead to 13-12 with 3:49 to play. But Willard then took a feed from Walsh behind the cage, rolled out to Hamblen’s right and tucked the ball to give Cheverus a 14-12 advantage with 1:53 remaining. Ultimately the Stags settled those nerves by winning possession and running out the clock. “Both teams played really hard,” Gorham Coach Mary Guimond said.